HOUSTON (CN) – The Environmental Protection Agency will make two companies pay $115 million to remove toxic waste from a riverbank in Houston submerged under a makeshift cap that was damaged by flooding from Hurricane Harvey. 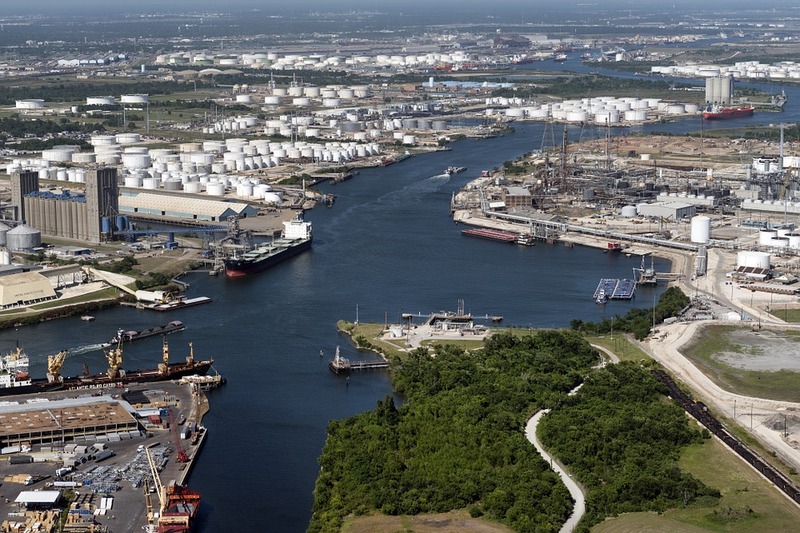 Close to a heavily traveled Interstate 10 bridge in east Houston, the San Jacinto River waste pits have been quietly seeping cancer-causing dioxin and heavy metals into the river and downstream to Galveston Bay for decades. The EPA added the pits to the national Superfund site list in 2008, acknowledging it is highly polluted and a cleanup priority. The site has spawned litigation from fishermen and local residents who say pollution damaged their livelihoods and their health. Signs by the pits placed by the Galveston Bay Foundation warn people not to eat more than 8 ounces per month of any fish or blue crab caught nearby, and children and pregnant women not to eat any seafood caught there. EPA Chief Scott Pruitt signed a directive Wednesday calling for International Paper, and Waste Management subsidiary McGinnes Industrial Maintenance to remove 212,000 cubic yards of polluted soil from the site, a project the EPA said Thursday will likely take more than two years merely to break ground. Temporary concrete caps were placed over the two pits, which are 14 and 19 acres, in 2011, according to the EPA. The EPA plan, called a record of decision, will be followed with negotiations with International Paper and McGinnes Industrial, with the goal of reaching a settlement that must be approved by a federal judge. The specter of litigation has already shrouded the talks as McGinnes Industrial said Wednesday it disagrees with the EPA plan because its soil and water tests after Hurricane Harvey’s floodwaters battered the caps showed that the structure “performed well” during Harvey. “We cannot support a plan for the site that provides less protection to all affected communities than the existing cap already has provided. We are deeply concerned that the decision announced today could result in a release to the San Jacinto River and downstream areas,” the company said in a statement. But the EPA said Thursday that samples collected by its dive team on Sept. 28 “confirmed the protective cap had been damaged and the underlying waste material was exposed” by Hurricane Harvey flooding. The samples showed dioxins above 70,000 nanograms per kilogram (ng/kg) of sediment. “EPA recommended clean up level for the site is 30 ng/kg,” the agency said. Pruitt has been vilified by environmentalists as a patsy for the oil and gas and coal industries since President Donald Trump tapped him to be the EPA chief and he took office in February, following his tenure as Oklahoma attorney general during which he sued the EPA at least 14 times, fighting its regulations for businesses in the oil-rich Sooner State. Pruitt confirmed environmentalists’ fears Tuesday when he announced the EPA is rolling back former President Barack Obama’s Clean Power Plan to reduce pollution from coal-fired power plants, fulfilling Trump’s campaign promise to try to revive the coal industry. But with the waste pit cleanup plan, Pruitt signaled the agency will not completely abandon its role as an environmental watchdog. Pruitt visited the waste pits in September after Hurricane Harvey swelled the San Jacinto River to historic levels, and met with environmental activists, including Jackie Young, executive director of Texas Health and Environment Alliance. “We are sincerely appreciative that the EPA has chosen the only option that is protective of public health and the environment,” Young told the Houston Chronicle on Wednesday. International Paper acquired the paper mill in the southeast Houston suburb Pasadena, the source of the waste pits’ pollution, in 2000 when it merged with Champion International Paper. Champion contracted McGinnes to dispose of the mill’s waste in the 1960s and McGinnes put it in containment ponds it built on the banks of the San Jacinto River. Over the years, the pits sank in a natural process called subsidence, and became inundated with increasing frequency by the river, leaching more and more toxins into it, before they were capped with concrete and large rocks in 2011, which the EPA called a temporary fix. If the EPA plan is approved it will not be the first time Waste Management and McGinnes Industrial have been held liable for the waste-pit pollution. The Harris County Attorney’s Office sued the companies for dioxin pollution in 2011, and obtained a $29.2 million settlement from them in 2014.